Jennie Mather Holcombe was born in January 1863 at Granby, Hartford Co., CT. She was the daughter of Joel Byron Holcombe and Delia Jane Holcombe. Jennie Mather Holcombe died on 7 July 1865 at age 2. Joel Collis Holcombe II was born on 7 December 1870 at Granby, Hartford Co., CT. He was the son of Joel Byron Holcombe and Delia Jane Holcombe. Joel Collis Holcombe II died on 5 October 1889 at age 18. The funeral of Joel Holcomb, son of the late Byron Holcomb, proprietor of the Old Granby Station Hotel for something like forty years, was held in West Granby Monday. He was boarding at Augustus Clark's at West Granby, at the time of his death. His health had been very poor for about five years. Saturday morning he arose as usual and was aobut the house and about noon retired for a little nap. Whe called to dinner by Mrs. Clark, he did not respond so she went to his room to awake him. She found him dead. Ar. Alfred Weed, the medical examiner, gave the cause of death as cerebral hemorrage. He leaves a brother, the Rev. George N. Holcomb of Philadelphia. He was a nephew of Mrs. Munson Holcomb, Henry P. Holcomb and Fred Holcombe. George Nahum Holcombe was born on 26 March 1872 at Granby, Hartford Co., CT. He was the son of Joel Byron Holcombe and Delia Jane Holcombe. George Nahum Holcombe married Florence Ann Gibson, daughter of John C. Gibson and Sarah Jane White, on 11 June 1905. [S25] Hannah McPherson, Holcombe Genealogy, Page 53.1/Item A-4-5-2-3-1-9-2-1-3. Florence Ann Gibson was the daughter of John C. Gibson and Sarah Jane White. Florence Ann Gibson married George Nahum Holcombe, son of Joel Byron Holcombe and Delia Jane Holcombe, on 11 June 1905. George Nahum Holcombe II died on 5 March 1908 at Amherst, MA. He was born on 5 March 1908 at Amherst, MA. He was the son of George Nahum Holcombe and Florence Ann Gibson. Sylvia Daphne Holcombe was born on 6 June 1910. She was the daughter of George Nahum Holcombe and Florence Ann Gibson. George Washington Holcombe was born on 1 June 1830 at Granby, Hartford Co., CT. He was the son of Joel Collis Holcombe and Fanny Pinney. George Washington Holcombe died on 4 March 1875 at age 44. He was buried at Near R. R. Station, Granby, Hartford Co., CT.
[S25] Hannah McPherson, Holcombe Genealogy, Page 53.1/Item A-4-5-2-3-1-9-2-2. Henry Pinney Holcombe was born on 19 July 1832 at Granby, Hartford Co., CT. He was the son of Joel Collis Holcombe and Fanny Pinney. Henry Pinney Holcombe married Hattie Holcombe, daughter of Ira Holcombe, circa 1867. Henry Pinney Holcombe died on 4 November 1900 at East Granby, Hartford Co., CT, at age 68. He was buried at Belmont, NY. Henry P. and Hattie were enumerated in the 1870 East Granby, Hartford Co., CT federal census, page 3. He is a farmer, age 37, Hattie is 28. No children are listed. For someone who died in 1899, Henry seemed quite well on June 1st, 1900 for the 1900 Census of East Granby. He is listed on page 1A, line 14, with Hattie. He is 67 and has been married for 33 years and he and Hattie have had no children. He is a farmer. Henry P. Holcomb, one of Granby's most prominent citizens, died here this morning of paralysis fo the heart at his home near teh East Granby railroad station after being ill for many years. Mr. Holcomb was a prosperous farmer. He was born July 19, 1832, in the house where he died. He was the son of Joel C. Holcomb, who was judge of probate here for many years and represented this district in the state Senate in 1832. In 1867 Mr. Holcomb married Miss Hattie Tracy of Belmont, N.Y., who survives him. He was sleectman here for a number of years and was sent to the state Legislature as representative in 1865. He was a life long democrat, but of the Jeffersonian kind and did not believe in Bryan. He descended from Revolutionary stock. He had no children and was the last of the genertion of Holcombs. The estate upon which he lived has been in the bossession of the family for about 260 years. He was a man well liked by all who came in contact with him. He was very hospitable and never turned one away who deserved help. He was wise and his opinions were always looked for here. The funeral will be attended at 1 o'clock tomorrow afternoon and the interment will be at Belmont, N.Y., in the cemetery where his wife's family are buried. [S25] Hannah McPherson, Holcombe Genealogy, Page 53.1/Item A-4-5-2-3-1-9-2-3. Hattie Holcombe lived at Belmont, Alleghany Co., NY. She was born in August 1841 at CT.1 She was the daughter of Ira Holcombe. Hattie Holcombe married Henry Pinney Holcombe, son of Joel Collis Holcombe and Fanny Pinney, circa 1867. Noah Webster Holcombe was born at Granby, Hartford Co., CT. He was the son of Joel Collis Holcombe and Fanny Pinney. Noah Webster Holcombe was baptized on 19 September 1848 at Granby, Hartford Co., CT.
[S25] Hannah McPherson, Holcombe Genealogy, Page 53.1/Item A-4-5-2-3-1-9-2-4. Jane Caroline Holcombe was born on 5 October 1807 at Hartford, Hartford Co., CT. She was the daughter of Joel Holcombe and Chloe Case. Jane Caroline Holcombe married William Mather, son of Return Strong Mather and Patty Shepard Clark, on 14 April 1835. [S25] Hannah McPherson, Holcombe Genealogy, Page 53.2/Item A-4-5-2-3-1-9-4. Sophia Holcombe was born on 4 August 1810. She was the daughter of Joel Holcombe and Chloe Case. Sophia Holcombe died. She was buried on 10 August 1830 at Simsbury, Hartford Co., CT.
[S25] Hannah McPherson, Holcombe Genealogy, Page 53.2/Item A-4-5-2-3-1-9-5. Huldah Phelps was born in 1784. She married Joel Holcombe, son of Hezekiah Holcombe II and Chloe Pinney. William Mather was born on 3 November 1800 at Hartford, Hartford Co., CT. He was the son of Return Strong Mather and Patty Shepard Clark. William Mather married Jane Caroline Holcombe, daughter of Joel Holcombe and Chloe Case, on 14 April 1835. William Mather died on 18 October 1863 at age 62. William Allen Mather was born on 8 September 1836. He was the son of William Mather and Jane Caroline Holcombe. William Allen Mather died on 25 January 1841 at age 4. 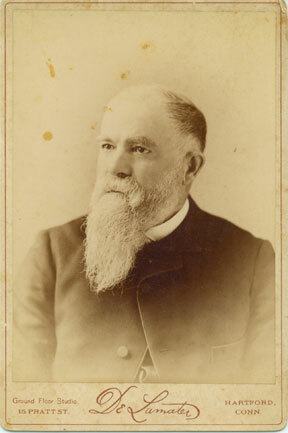 Oliver Holcomb Mather was born on 1 February 1839. He was the son of William Mather and Jane Caroline Holcombe. Oliver Holcomb Mather died on 29 January 1840. William Allen Mather was born on 8 July 1840. He was the son of William Mather and Jane Caroline Holcombe. William Allen Mather died on 23 November 1863 at age 23. Oliver Holcombe was born circa 1805 at CT.1 He was the son of Alexander Holcombe and Tryphenia Thrall. Oliver Holcombe died; at age 4 weeks. Henry Alexander Holcombe was born on 16 September 1808 at CT.2,3 He was the son of Alexander Holcombe and Tryphenia Thrall. Henry Alexander Holcombe married Fidelia Phelps, daughter of Samuel Phelps and Delia Whiting, on 29 November 1829. Henry Alexander Holcombe married Hannah Trask on 13 April 1834 at Portage Co., OH. Henry Alexander Holcombe died on 10 September 1844 at OH at age 35. "Dear Sir—With painful emotions I hasten to announce to you the painful intelligence of the loss of Friend Thrall and his family, from Granby, Conn, and Henry A. Holcomb's wife and child, from Simsbury, together with four ether persons, viz. two sailors, a lady, and a little girl belonging to Ashtabula, on the lake, Saturday morning, 29th of Sept. about 4 or 5 o'clock. Respecting particulars I can merely say that the vessel capsized in a gale of wind and went to the bottom. Mr. Thrall and family, with Mrs. Holcomb and child, and probably in the vessel, which sunk in 50 or 60 feet of water; the top of the mast is about 8 feet out, and strange to relate, the captain and the hands, with Mr. John White of Ohio, Alexander Holcomb.esq. and his son Henry A. Holcomb, from Simsbury, clung to the rigging about the top of the mast until Saturday evening at 6 o'clock, say 12 or 14 hours, when they were taken off by a vessel passing up the lake and were carried to Cleveland. They stayed at my house last night, and have gone down the lake to the place where the vessel is. The vessel went down off Salem about five or six miles. They are in hopes of being able to raise it and obtain their bodies, which seems to be their greatest trouble. You will please communicate to sooth their feelings, and assure them that the survivors are in pretty good spirits, although they had to put in requisition the last effort of expiring hope to sustain themselves until they were discovered. Mr. Holcomb was so much exhausted that he declared It impossible for him to hold on one minute longer even when the boat to relieve them was close by; but being encouraged and assisted by his companions, he was kept from going down until the boat arrived and took him in, so fatigued as to be apparently lifeless. You may expect the particulars as soon as it is ascertained whether the vessel is raised or not, but expect not to get an adequate idea of the" sufferings of the survivors, for language is without words to express it. [S25] Hannah McPherson, Holcombe Genealogy, Page 53.2/Item A-4-5-2-3-1-10-3. [S25] Hannah McPherson, Holcombe Genealogy, Page 53.2; Item A-4-5-2-3-1-10-3. [S807] Find A Grave, online http://www.findagrave.com, memorial ID # 40010409. Hiram T. and Amanda M. were enmerated in the 1850 Hamden, Geauga Co., OH, federal census. He was a blacksmith age 26, she was 19. Children in the household were William 3 and Alice 1. Hiram was enumerated in the 1860 Seward, Winnebago Co., IL, federal census. He was a blacksmith age 35. Others in the household were Alice 11, Mary 9, and Sylpha(sp?) 22. William Harrison was enumerated in the 1840 Trumbull Co., OH, federal census. There were 2 males and 4 females in the household. William was born in Simsbury Hartford County CT circa 1812/1813 according to US census records for CA. In 1835 at Batavia Geauga Trumbull County Ohio he married Sarah Anne Thompson the daugher of William and Elsie nee Hampton Thompson. She was born circa 1816 Sussex County New Jersey. Sarah’s sister Antoniette was the wife John Flavel Holcomb who was William’s cousin. They had 5 children: Charlotte b. 9/1/1836 d. 4/8/1893 San Franciso CA; Ellen b. 1838, Georgiana; William Thompson d. 8-9-1862 age 19 at Eugene City Oregon which is reported in the Mountain Messenger; and Penbroke b.1841 They were all born in Trumbull County Ohio. When Sarah died circa 1849 at Vernon County William sent his eldest daughter Charlotte then 14 to live with John Flavel Holcomb then residing in MO. and his other 2 daughters to live with his sister Janette then residing in Rockford ILL.
William H. Holcomb was enumerated in the 1850 Msopotamia, Trumbull Co. OH, federal census. At some point John Flavel and family moved to CA taking Charlotte with them. No later than 1860 William and his 2 sons also moved to CA to the township of St. Louis, Sierra County. On 6/2/1860 for $600.00 William purchased a store located on Main Street that he had been managing for some months. Deeds Sierra County Book D p.766 He also purchased a home which he homesteaded located nearby which he shared with his young wife Cynthia surname unknown. No record of their marriage has been found. According to the 1860 US census Cynthia was then age 26 which was 22 years younger than William. According to this census she was born in Ohio therefore they may have married there. About a year later William became seriously ill. His doctor advised him to move to a healthier environment which he did and sold his store on 4-17-1861 and thereafter moved to Indian Ranch a foothill in Keystone Valley La Porte County which was nearby his cousin John’s farm. William’s health did not improve but rather declined rapidly; he did 7-16-1861 at age 49. He is the first to be buried in the Keystone Cemetery in the John Flavel Holcomb’s family plot. His marker simply reads Cousin Harrison the name the family called him. Register of Graves Keystone Cemetery Row 4 Lot 18. His cousin John died a week later and his grave is next to William’s. See a Grave provides a photo of the marker. All the above info unless otherwise indicated is taken from the “The Road Thru Rabbit Creek-The Search for Gold in Old La Porte, author Emma Barham Callaghan the grand daughter of William’s eldest daughter Charlotte. All dates she states are based on the Barnham family bible. Book published 1999 Great Basin Press Reno Nevada. [S811] Emma Barham Callaghan, Rabbit Creek, page 201. [S807] Find A Grave, online http://www.findagrave.com, Memorial 38416207. Janette was enumerated in the 1850 Middlefield, Geauga Co., OH, federal census. She was 34, born in Connecticut. Children in the household were Ellen 12, Caroline 9, and Thomas 1. Also in the household was Josiah Bowles 15. Nearby was father Alex and his second wife Asenath. Jane Hall was enumerated n the 1880 Rockford, Winnebago Co., IL, federal census age 64 in the houoehold of her son Thomas and his wife Sarah. Mrs R. Hall is dead. Aged Rockford lady passes away this morning. Death occurred at her home on Rockton Ave. A resident of Illinois since 1851 .....She was born in Htfd County CT 5/31/1816 making her 84 if she had lived until next month. She moved to Grange County ?Ohio with her parents at age 16. She was married to Talcott Holcomb 8/3/1834; he died in 1847 leaving her a widow with 3 young children With them she came to Il in 1851. She was united in marriage with Riley Hall 11/14/1855 To this marriage was born one child Millie who died 2 weeks before her father in 1872. .....Mrs. T. H. Brown the only one of her children living and Mr. O.T. Holcombe of Winnebago, her brother who is now the last of a large family other relative and friends are left to mourn her loss. [S807] Find A Grave, online http://www.findagrave.com, memorial 125911144. Oliver and Jerusha were enumerated in the 1860 Winnebago, Winnebago Co., IL, federal census. He was 41, she was 43. The only child was Adie 11. Oliver T. Holcomb, aged resident of Winnebago, died yesterday afternoon 3at 2 o'clock. One of the oldest residents of this place, he died yesterday afternoon at his home here of an illness caused by his great age. For many years Mr. Holcomb conducted a grain business at this place. He retired some time ago and had lived in the village. His daughter Mrs. Addie Hunter, is the only relative to survive in this city. The funeral services will be held from the home Wednesday morning. [S772] Patricia Angeli, "Alexander Holcomb," e-mail to James H. Holcombe, 5 Feb 2014. [S807] Find A Grave, online http://www.findagrave.com, memorial ID #132012647. Julia E. Holcombe was born at CT. She was the daughter of Alexander Holcombe and Tryphenia Thrall. Julia E. Holcombe died; at age 4 months. Welthia Ann Holcombe was born at CT; never married. She was the daughter of Alexander Holcombe and Tryphenia Thrall. Welthia Ann Holcombe died before 1851 at OH. James Otis Pinney was born in 1826. He was the son of Orator Pinney and Lovinia Holcombe. James Otis Pinney married Sarah Ann Rhodes in 1848. [S25] Hannah McPherson, Holcombe Genealogy, Page 53.2/Item A-4-5-2-3-1-10-2-1. Sarah Ann Rhodes married James Otis Pinney, son of Orator Pinney and Lovinia Holcombe, in 1848. [S807] Find A Grave, online http://www.findagrave.com, memorial ID # 40010323. Samuel Phelps married Delia Whiting, daughter of Joseph Whiting, at West Hartford, Hartford Co., CT. Samuel Phelps was born on 18 October 1788 at Simsbury, Hartford Co., CT.
Delia Whiting was the daughter of Joseph Whiting. Delia Whiting married Samuel Phelps at West Hartford, Hartford Co., CT.
Hannah Trask was born on 11 August 1813 at Ostego Co., NY. She married Henry Alexander Holcombe, son of Alexander Holcombe and Tryphenia Thrall, on 13 April 1834 at Portage Co., OH. Hannah Trask married Stephen Foster. Erastus Roberts was born on 25 June 1781. He was the son of Nathaniel Roberts and Rhoda Woodford. Erastus Roberts married Hilpah Holcombe, daughter of Hezekiah Holcombe II and Chloe Pinney, on 21 August 1805. John Sackett was the son of John Sackett and Abigail Hannum.